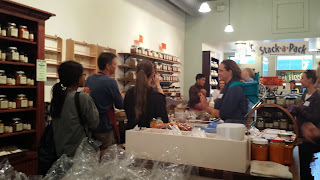 I headed out to Savory Spice Shop in Lincoln Square again on Sunday and snagged a premium parking spot right in front of the store for my very first event with the Chicago Food Swap. I've been following them online for at least a year and kept meaning to actually go to a swap. What's not to like? 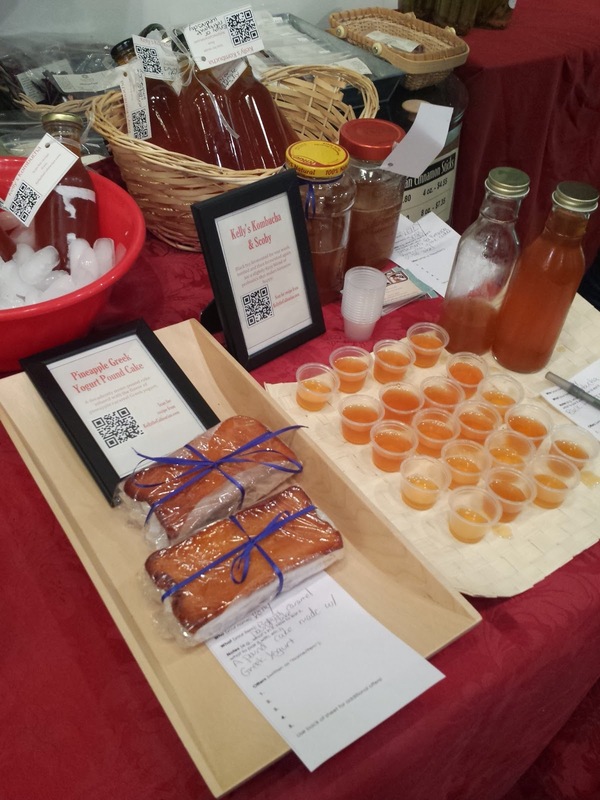 You show up with a few of whatever homemade goods you'd like to share, then check out the gourmet, homemade goods other local food enthusiasts have to share. 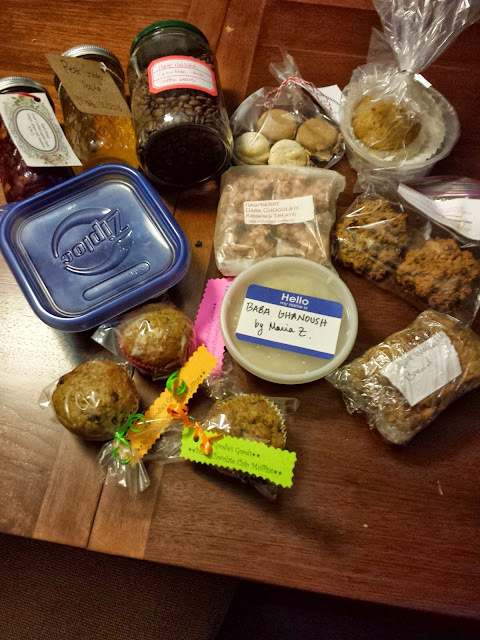 After indicating your interests, you wheel and deals until you're out of goodies and leave with a bag full of interesting items to try. All for free. Not a single cent ever changes hands. I was really nervous no one would want my stuff. My former coworker, Jennifer, encouraged me to try something different and that out-of-the-box items do the best. She also told me it's rare that you end up taking home stuff, and told me to consider packaging. On her suggestion, I decided to bring several bottles of kombucha, two SCOBYs (kombucha starters) and two loaves of pineapple caramel pound cake. I made sure to package everything nicely and thought about how I would set things up. I ended up buying some cheap picture frames and typed up a quick description of each item. I also made a QR code for the recipes' links on my blog so people could check out all the info if they were interested. I also got a package of business card paper from the store and printed out labels with the QR code and my blog address for each of the bottles on kombucha. I got sample cups at a restaurant supply store, too, and set aside a bottle to use for that purpose. I got to the shop and set up, then perused all the wares. 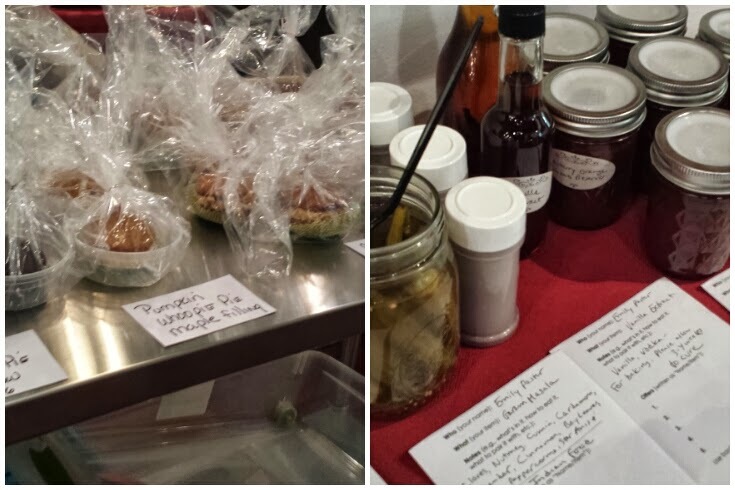 There were some really interesting, beautiful items, like Polish apple buns and home-roasted coffee beans. There was also a 15-year-old girl with the most amazing macaroons. Way to set the bar high! Homemade sodas, canned apple pie filling and peanut butter cups all tempted me. Most people offer samples, so I enjoyed all the little bites, too. How it works is that you "shop" for a while and indicate the items you're interested in my writing your name and what you're willing to swap it for. Then, the organizer announces it's time to swap and pandemonium breaks out. You have two choices - take your wares with you to the items you're interested in or let them come to you. Since I had so many bottles and they were cumbersome, I let people come to me. The SCOBYs went fast, but so did everything else! I was so pleased that people were interested in my stuff. 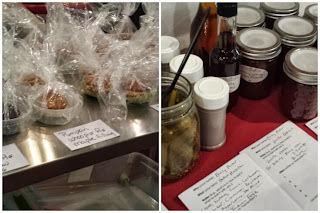 I got some of the most amazing baked goods, the roasted coffee beans, apple honey, pear ginger vodka, black bean goat cheese dip, baba ghanoush and the nutella macaroons I lusted over. I'm so excited to try all these items and sign up for the swap again next month. I learned a lot in this first session and look forward to swapping again. This sounds like a really fun event! I'm glad you got a lot of fun new food to try out, and I love how you packaged everything. Glad you had a successful event! This sounds so fun! 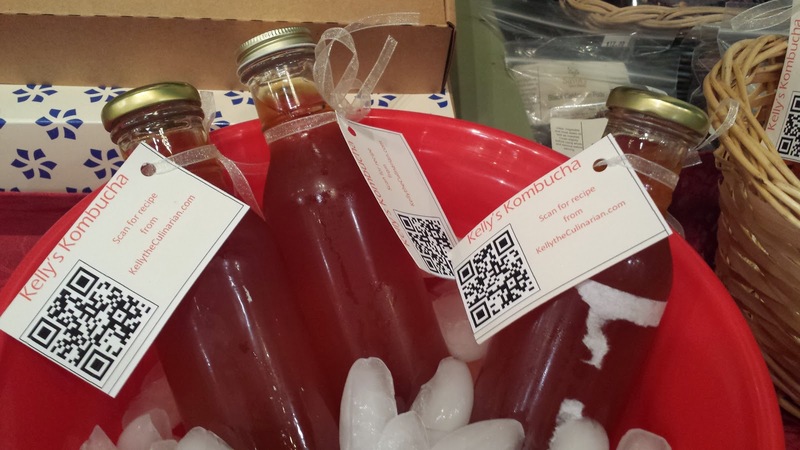 Your packaging was fab… loved the use of the QR code to link to your blog! Can anyone show up without having things to swap? Maybe to buy the leftover items? Just to try new things. Can anyone just show up to, maybe, purchase the left over food? For possible donation to food banks or to try oneself. You have to register in advance, but registration is free. The registration for the next event usually opens the day after the event. The Nov. 10 swap at The Chopping Block is already full, but there is a wait list. Get the info at ChicagoFoodSwap.com.